PS2BOR emulator for the PS2... which is a port of OpenBOR. OpenBOR is the Beats Of Rage engine (think Streets Of Rage). NOTE: This package should be used specifically with the Homebrew "GAMENAME" in the title of the ISO downloaded... as only one game per emulator is allowed with this version... game to be re-labeled as "bor.pak". 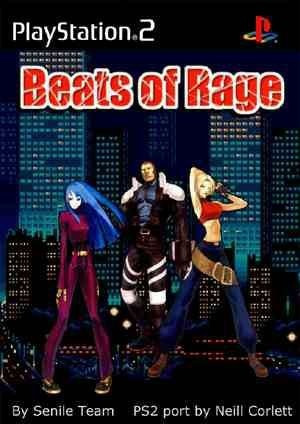 OpenBOR is the open source continuation of Beats of Rage, a Streets of Rage tribute game originally developed by Senile Team. In the years since it has grown into arguably the single most powerful two dimensional sprite based engine in the world and certainly the most versatile. While intended to allow creation of side scrolling beat em’ ups like Double Dragon or Final Fight, the engine is also capable of replicating Shumps, RPGs, platformers and the like. A built in scripting engine allows authors to take it even further, making imagination the only real limit. See www.chronocrash.com for more details and to download the latest versions. NOTE: These instructions only apply to the OpenBOR zips found here. 2. Any of my "BOR" ISOs. 3. Games (an "OpenBOR" game, renamed as "bor.pak"... ONLY-One Per-ISO). 5. Time- A few minute learning curve the first time. 1. "OPEN" the ISO with "UltraISO". 2. "NAVIGATE" to where you have your "games" stored. 3. "RENAME" the game you would like to ADD, as "bor.pak". 4. "HIGHLIGHT" the RENAMED game you would like to "add". 5. "DRAG+DROP" your game into the ROOT of the ISO. 6. Click "FILES" Tab > "Properties", make sure "UDF" + "ISO9660" are checked. 9. Click "YES", when the "Save-Changed-File" box appears. 10. "MOVE" the CONTENTS, of ALL folders in the zip, to where its !FOLDERNAME! says. 11. "BOOT" OPL, and Launch your game from whatever menu corresponds to your device. Senile Team - Creating the Steets Of Rage tribute game dubbed "Beats Of Rage". Chrono Crash - THE OpenBOR website, Developers, and projects. Neill Corlett - Porting OpenBOR to the PS2. UniqueUserName - Creating/Compatibility-Testing the OPL-PORT ISO image, writing Noob-Friendly Tutorial/Manual, adding OPL Background Art, and putting together the rest of the "pre-configured" package (which you are currently viewing).